The fabulous obelisk sundial dated 1630 with 61 separate sundial faces, by John Mylne, master mason to Charles I, at Drummond Castle Gardens at Muthill near Crieff. Welcome to my website which aims to detail all of the Scottish sundials that I have been able to see, photograph and record. I have also included sundials from other places that I have found accidentally (mostly in Europe whilst on holiday), and others from England which I have looked for whilst on visits there, mostly in the Norfolk/Cambridge area where one daughter lives, and in the Milton Keynes area where my other daughter lives. You may also see one in Barbados in the “Favourite Sundials” page (wishful thinking really — the photo was sent to me). The sundials that I have recorded are included in the “Sundial Register” page. You can use the links on the left hand side of each page or at the bottom of this page to navigate to the various areas of this website. 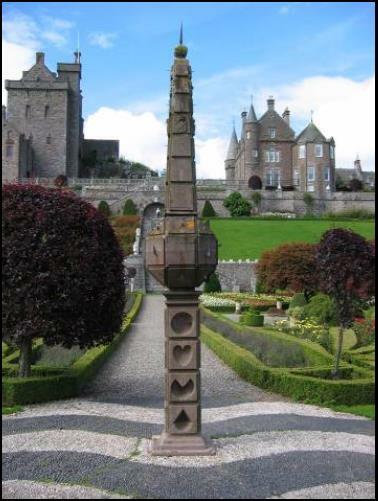 My interest in sundials was first kindled when I saw the wonderful obelisk sundial (photograph alongside) at Drummond Castle Gardens in 2004. I didn’t know that sundials like that existed and I was hooked. Scotland has a rich heritage of 17th and 18th century sundials and the great variety of sundials shows that the dial makers had scientific, artistic and practical aims. (Stevenson 1937). There are a number of reasons for their appearance in Scotland during this period. Firstly, interest in science and mathematics was increasing significantly. Secondly, Calvinist philosophy at this time frowned on decoration for its own sake and required function as well. These sundials are often found on 17th century churches, on stately / historic homes and in their gardens, on market crosses (known as mercat crosses in Scotland) and often on the walls of houses in villages of around 17th century vintage. Examples are also found in museums such as those in Edinburgh, Peebles and Ceres. 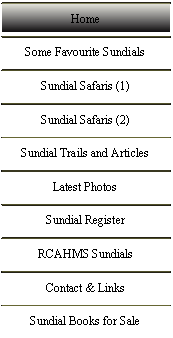 Some, such as obelisk sundials (see the main photo on this page), are virtually unique to Scotland. Their origin is a matter of speculation. While many of the earliest multiple dials to be found in England exhibit German or French influences, the Scottish mind for mathematics and science took the multiple dial in a way that is found nowhere else. These dials are a masterpiece of the dial maker’s art and are a highly distinctive product of Scottish craftsmanship. They show a remarkable passion for dialing in all its most complex mathematical forms (Daniel 2004). Lectern sundials such as that at Inveresk Lodge, are from a much earlier date in Scotland than elsewhere in Europe (apart from one similar example in Holland). This suggests that these two types of sundials (obelisk and lectern) may have originated in Scotland and that the designs were not imported or copied from elsewhere. Sundials on churches and mercat crosses were truly functional and served a real purpose, whilst others on and around the stately homes were likely to have been the status symbol of the day and were intended to show how important, knowledgeable and wealthy the owners were. Examples of these status symbols at the very top end of the scale are the sundials at Drummond Castle Gardens with 76 separate dials and Glamis Castle with 84 dials. The sundial shown at the header at the top of each page in this website is dated 1633 and is on the wall of the church in the old and picturesque East Lothian village of Garvald. It is one of the oldest dated sundials in Scotland. If you have any questions on Scottish sundials please feel free to contact me. See the Contact & Links page for my contact details. For a preview see the “Sundial Books for Sale” page.